The following featured companies used SAFplus as their underlying management and systems software upon which to build their best-in-class applications. These products won multiple awards and had rapid carrier adoption. Session Border Controllers (SBCs) provide complex functionality in a SIP network: security, routing, policy control and transcoding. Sonus’s 5000 series SBCs used SAFplus to provide the underlying management and systems software, thereby freeing up engineering resources to work on developing differentiated features. Sonus subsequently built advanced security services, together with high levels of simultaneous transcoding, resulting in widespread carrier/enterprise adoption and multiple industry awards [1,2,3]. Recently AT&T announced their mobile network evolution, with Affirmed’s AN3000 being front and center . 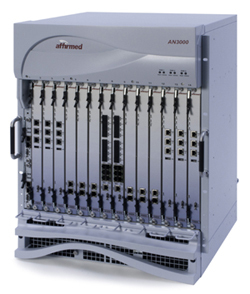 Affirmed chose to use SAFplus as their system and control software confident in the ability of OpenClovis to fulfill Tier 1 carrier network requirements. This allowed Affirmed to focus on delivering their own best-in-class rich application and content delivery services, something that AT&T found extremely compelling. Affirmed’s development cycle, from concept to carrier adoption, was 18 months.